It is quite apparent that the crisis brought about a need to correct strong external imbalances and the excessive private sector debt build-up prior to the crisis. The extent of adjustment is directly related to the extent of the previous current account disequilibria and private sector debt build-up. These adjustments (and their severity) entail clear medium-term costs in terms of GDP growth and employment. Furthermore, patterns of adjustment across CESEE economies vary greatly, with some countries (such as Croatia) relying almost exclusively (even in the medium term) on import restraint, while others (e.g. the Baltic states) were more successful in terms of export growth. The success of the EU economic policy stance, which the non-member countries in Southeast Europe also follow to a large extent, depends on the revival of external demand. Household consumption will grow only slowly, if at all, and public consumption is set to decline further. Private investment will have a hard time picking up, given high levels of corporate debt, weak banks and consequently very low credit growth with external demand subdued. If the expectation is that structural reforms will spur investments and exports, it may take some time before that actually happens. In the meantime, this could well lead to an ever-widening divide between the various European regions. This stands in sharp contrast to the previous perspective widely subscribed to in the mid-1990s. From that time on, the conventional wisdom was that Europe displayed clear signs of ‘convergence’ at the inter-country level, with low-income economies growing at a faster rate than rich ones. Up to the recent crisis broadly convincing evidence was found of narrowing inter-country income gaps in a wide range of countries based on the availability of cheap finance which does no longer exist. Important groups of economies, such as the Southern EU Member States and most of the countries of Southeast Europe, have come up against a vicious circle: high initial debt levels and dim growth prospects translate into greater doubts about debt sustainability. The resulting higher interest rates impose a constraint on investment and encourage corporate and household deleveraging which is further compounded by the fragile state of the banking system. This dampens consumption expenditures, and leads to cutbacks in employment (and wages), which, in turn, lower household incomes and domestic sales prospects. The induced lower GDP growth outlook, in turn, raises concerns over debt sustainability and fosters the need to keep interest rates high. Similarly, the fiscal stance adopted by most EU countries has been rather restrictive. This will be followed by even more fiscal austerity, as it proves increasingly costly to finance fiscal deficits and refinance public debts. 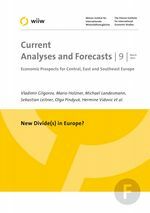 Two special chapters of this forecast report cover recent developments in the labour markets of the CESEEs and the situation of the banking sector respectively. Towards the end of 2011 the employment situation has deteriorated again and unemployment rates especially for young people have markedly increased. The outlook for the coming years looks very grim. Workers migration from the NMS towards Western Europe kept increasing during the crisis. We also cover the process of retrenchment in credit activity by foreign banks in CESEE and analyse general deleveraging and spillover effects from the crises in Greece and Hungary via Western European banks.